A brief introduction in which the author explains why she was inspired to re-work so many venerable tales and tropes. One author has a nasty habit of writing about his girlfriend. This would not necessarily be nasty were it not that the unfortunate girlfriend is transmogrified by his stories. As he writes she disappears into the stories. When she emerges, she has changed. It’s regrettable but … art requires sacrifices. The protagonist has prayed for a miracle. Not only does she get it, she becomes a saint. It’s nice to be able to work miracles; it’s not so nice to be mobbed by people who want their own miracles. Fleeing the hunter, the unicorn is drawn to the maiden. There is an unexpected ending. Unwitting students are asked to play roles as characters from the Matter of Britain. They find themselves unwitting players in a war between two figures determined to reshape reality. The pawns realize that every version of the Arthurian tales ends in their deaths. But what can mortals do to change this old old story? To be transformed, body part by body part, into a mighty cathedral: a miracle! (Just as saints’ bones gave rise (indirectly) to glorious cathedrals.) It’s a horror if the process begins before death. Her old life ruined by her abusive, controlling boyfriend, the woman asks helpful ghosts to transform her into something new and beautiful … and savage. A dream offers the dancers hallucinatory surroundings … and death. The life cycle of the saints, featuring a miraculous island composed entirely of bones. Everyone has their curse. Living with curses can be hard. Breaking them, more-so. Or perhaps it’s all a matter of perspective. Her best friend had vanished, leaving behind only the maps of their shared childhood. How could those help? A child marked by portents is dying. Who wouldn’t willing offer their life to save a child? A normal person would have ignored the bird who transformed into a naked man. Artists see, and having seen, depict their visions. Dragged like Eurydice from the afterlife, she was his perfect woman: passive, well behaved and quiet as the grave. But how did she die in the first place? and having remembered, what will she do about it? The legal duelist takes pride in her art, risking her life in the cause of righteousness. What to do, therefore, when presented with a duel where victory or loss both undermine the principles on which the duels are based? What a jolly life the Knight has, testing men’s characters when he knows the rules and they do not. His wife is a central element in his tests; after ages of being used, she has a test of her own for her husband. A model finds a way to be more than the prop her photographer uses to create his visions. All of the stories feature beautiful prose. Many of stories feature male characters who are terrible people. Not terrible in unrealistic ways, mind you. Perhaps there’s some excuse in that many of her characters, male and female, find themselves trapped by: A. circumstances, B. poor decisions leading to unforeseen outcomes, and C. magic. Escape requires bold decisions and a willingness to sacrifice. The first and final stories are well placed in the collection, being close to mirror images of each other. One explores submission; the other transcendence. The second is far more hopeful than the first, and a fine note on which to end the collection. 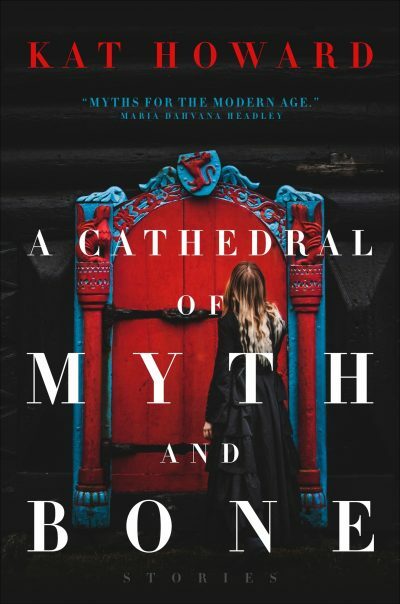 A Cathedral of Myth and Bone is available here (Amazon) and here (Chapters-Indigo). And "transformed into a mighty cathedral" reminds me of a recently repeated modern radio remake of "The Bed-Sitting Room", in which weird events after World War Three include the justified fear of turning into a bed-sitting room. Since I also frequently hear "The Goon Show" repeated, it's oddly similar but quite different.